After nearly 30 months and over $530 million — including $255 million in public funding — the Sacramento Kings are finally set to play a regular-season game in the sparkly new Golden 1 Center in downtown Sacramento, California. It’s been described as “the highest-tech stadium” in sports, and is seen by many as the result of prudent work by new team owner Vivek Ranadive and Sacramento Mayor Kevin Johnson, a former NBA player. However, the luxurious new building may be the anthesis of the hard work by another pair of saviors in Sacramento, nearly two decades ago. They arrived to the team nearly a month apart — Chris Webber through trade in May 1998 and Jason Williams as the No. 7 overall pick in the June 1998 NBA draft. Webber would soon become the face of the franchise, and along with Williams and veteran center Vlade Divac, usher in an era of prosperity the likes of which the franchise had never seen. C-Webb and J-Will were steely, cold badasses who would stare you down and cuss you out after a vicious crossover or a nasty dunk. Napear is not alone in that estimation. “The rampant success during that stretch gave the pro-arena groups lots of material to work with,” said Tom Ziller, editor of famed Kings blog Sactown Royalty. Ziller and his site, along with local radio host Carmichael Dave, helped push the Here We Stay movement, a public uprising largely credited with saving the Kings from relocation to both Anaheim, California, and Seattle in the 2010s. 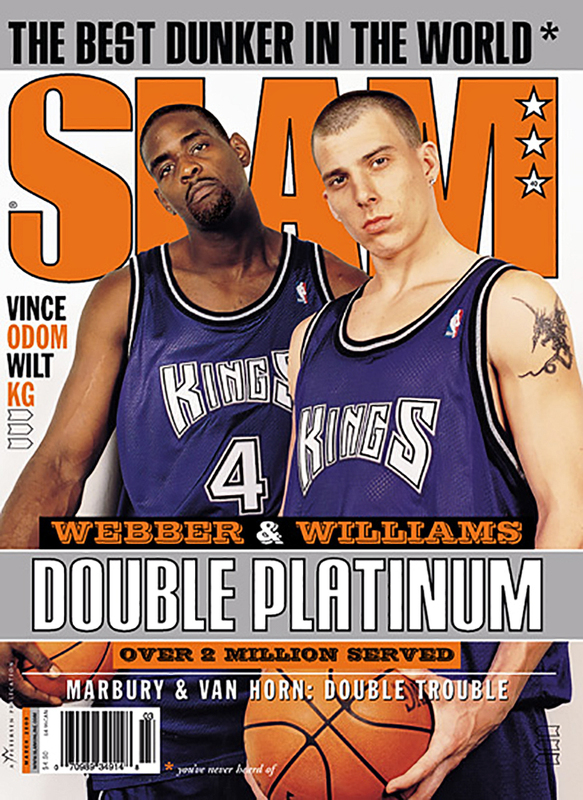 For many, the Kings’ first true dose of national attention was the cover of Sports Illustrated’s Feb. 19, 2001, issue, but Sports Illustrated was actually beaten by a full year: The then less-heralded duo of Webber and Williams graced the March 2000 cover of SLAM. The publication, launched in 1994, and originally dubbed “The IN YOUR FACE Basketball Magazine” meshed basketball and hip-hop culture and became the hoops world’s answer to VIBE, and The Source, in the mid-’90s and 2000s. SLAM was part of Harris Publications, which owned XXL, and both publications had a polished and aggressive spirit. While the Sports Illustrated cover depicted the Kings stoically, with a glow surrounding them, the SLAM cover had attitude. Shot by photographer/director Jonathan Mannion, famous for shooting Jay Z, Nas, OutKast, Lil Wayne, Run-D.M.C., Drake, Kendrick Lamar and so many iconic hip-hop artists, he was also known for photographing athletes such as LeBron James, Kevin Garnett, Stephon Marbury and Dwyane Wade. Webber towered behind Williams, head cocked and face in a scowl. All fun and games on the court, here Webber is mean-mugging, with a vein bulging through his bicep. Williams, by contrast, is doe-eyed, with a diamond stud hanging from his ear. The cover had a certain hip-hop feel, a grittiness that popped. C-Webb and J-Will were steely, cold badasses who would stare you down and cuss you out after a vicious crossover or a nasty dunk. Williams was revered both in the locker room and in the community of Sacramento, but in 2001 was traded to the Vancouver Grizzlies for Mike Bibby, who would go on to become a Sacramento cult hero in his own right. Then the Kings tragically peaked during the controversial 2002 Western Conference finals against the Shaquille O’Neal and Kobe Bryant Los Angeles Lakers. They lost the infamous Game 6 in Los Angeles, which caused Webber to say years later that “something smelled weird about the whole situation.” The Kings then lost a heartbreaking Game 7 at home in overtime: Webber, despite a reputation for sometimes shrinking in big games, nearly dropped a triple-double — 20 points, 11 assists and eight rebounds. The franchise has never reached another conference finals. Bansky Gonzalez is a Sacramento-based writer currently attending California State University, Sacramento. He's always down to defend LeBron James or Young Thug's legacy against whoever, whenever and wherever necessary.